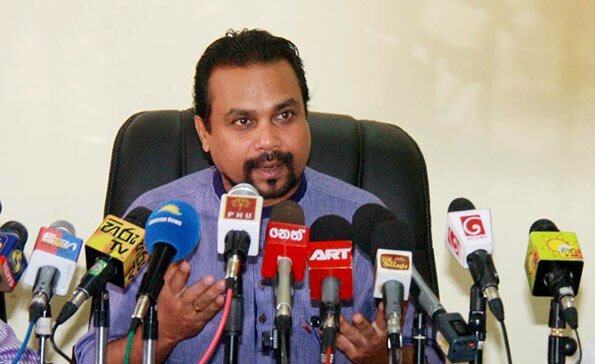 National Freedom Front (NFF) Leader Wimal Weerawansa said yesterday that MP Hirunika Premachandra should have been arrested already over the Dematagoda abduction if the independent police commission was ‘genuinely’ independent. “MP Premachandra has still not been arrested and this proves that the police commission is not really independent. The government established these commissions to act without government or any other influence. But it seems that the word ‘independent’ holds no value as assured by the government,” he told a news conference at the Dr. N.M. Perera Centre in Colombo. Meanwhile, he mentioned that the reins of the government were not in the hands of either President Maithripala Sirisena or Prime Minister Ranil Wickremesinghe, but in the US, India and LTTE Diaspora. He pointed out that it was a requirement of these external elements which had made the government to introduce a new Constitution. “None of our citizens had asked for a new Constitution. The Diaspora wants it to decentralize the power of the State and execute their sinister agenda in the North and East, to merge them,” he said. He requested people to raise their objection against the government to rectify the mistake they had made an year ago. You are sanitizing public with ur clever speech.But these sanitisers will not go through but may be in Kulutara. So as a political leader what’s the reason for u n ur families forge BC n PP. These are the greatest traits ever made to the government rather than these silly land grabbing.first of all where is the justice for ur case. Where is the independent investigation on ur case? We are not talking about the young w***n that u s**pt with, it’s out of topic but U r a great traitor ever for cheating the gov as a parliamentarian. When Hon Weerawansa said “that the reins of the government were not in the hands of either President Maithripala Sirisena or Prime Minister Ranil Wickremesinghe, but in the US, India and LTTE Diaspora”, he got the pecking order wrong. What he should have said si”that the reins of the government were not in the hands of either President Maithripala Sirisena or Prime Minister Ranil Wickremesinghe, but in the LTTE diaspora, India and US”. The people of this country do not require a new constitution. What they require is the means to survive day-to-day lives which will not require mothers and sisters from the villages to prostitute themselves to oil rich sheik monsters in the Middle East just to ensure food on the table in their homes. I thought both Wimal and the old delinquent had gone into hiding with no one listening to them. At least now they know their glory days are over. RIP you scoundrels.